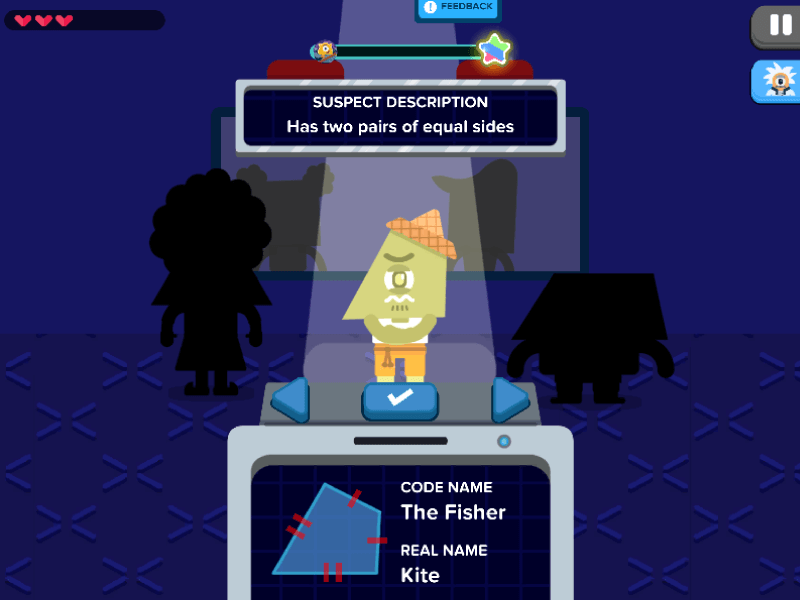 Help the police identify criminals by classifying quadrilaterals. It seems some suspicious shape shifters are approaching things on a bad angle, and have turned to a life of crime. The Zapzapmath police have released a call for public assistance to address this severe matter. They need volunteers and witnesses to come in and identify these criminals so that they can give them the third degree and gather good confessions. As a concerned citizen of the Zapzapmath universe, you have gladly come forth to help identify the offenders and restore justice back to the Zapzapmath society. To do so, you have to see if the suspect descriptions provided by the police align with the character profiles on file. The given descriptions are clues to which shaped character you are searching for. If the suspect is described to have four equal sides and four right angles, and you have a lineup of a square, a trapezoid and an isosceles right triangle, by classifying quadrilaterals you can deduce that the criminal is a square since it's the only one that fits the description. Be careful though, because a lot of shapes share similar qualities. Which is why it is important to take your time to inspect each suspect and their individual properties and shapes. Once you have identified the criminal, click on the green button to enter your submission. The right answer will ensure that all the bad criminals are locked up until they change negative angle to a positive one. If you get a wrong answer, do not worry; the policeman will guide you towards the right one. Shape Inspector is a game that allows you to participate in a fun and mysterious investigation of the different types of shapes. By studying the descriptions and classifying quadrilaterals, you are getting to know the shapes and their many attributes. Different quadrilaterals can share some characteristics, therefore analyzing the options requires good attention to detail. Though identifying and expanding quadrilateral attributes may seem daunting, the gameplay to Shape Inspector is so engaging that it naturally increases a player’s knowledge of quadrilaterals and their properties in the form of recurring practice. Careful study and proper analysis are promoted all throughout the game. This contributes to a boost in math confidence as well as a stronger foundation in shape evaluation. These naughty criminals may be in horrible shape, but with your help, the police can set them straight! Some shapes are just born shifty.